It’s almost impossible to meet a gamer who hasn’t heard of the game of Pacman. The hungry hero and the game itself have become so popular that they represent arcade games and have given the honor of a phenomenon to video games rather than being considered a fad. Pacman created its own market outside just video games with clothes, cartoons, book, toys and even food products, and it all began with a small idea of an eating game. The Pacman game was launched in Japan in 1980 and in North America in 1981 and the developer was Namco for the Coin-op video arcade cabinet platform. Pacman happens in a single screen furnished with a labyrinth populated by dots. A ghost generator is located in the lower center and the lower half of the center screen contains Pacman. Gamer’s objective is to gulp all the dots without being caught by a ghost (called Monsters in the game). If Pacman is touched by a ghost, the little overeater is curtained. However, Pacman is equipped with his own weapons in the form of power pellets on every corner of the labyrinth. 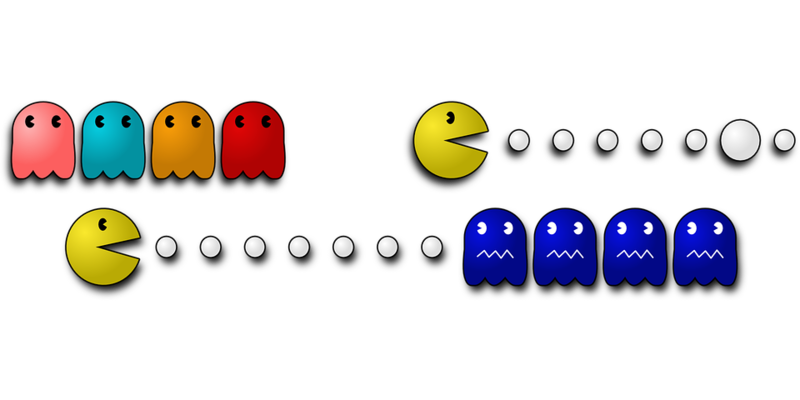 When Pacman eats one of them, the ghosts become blue, which means that Pacman can safely chomp on them. Also, upon eating, the ghosts become floating eyes which then run quickly into the ghost generator to get a new skin. While points are collected by Pacman by gulping power pellets and dots, bonuses are also collected by him for every ghost eaten and even more bonuses come his way when he eats fruits that pop up in the maze randomly. Once your Pacman gobbles up all the dots, you complete the level and a short cinema is played that shows Pacman and ghosts chasing one another around various scenarios. This was one of the oldest examples of films between levels, later upgraded to include a narrative in 1981 in Donkey Kong. Every level has got the same design as the first one; but only the ghosts become faster and the effects of power pellets last for a shorter while. Actually the game of Pacman was designed to end never or until all lives of the player were lost. However, it can’t be played after the 255th level because of a bug. At this level, you can’t see the dots and network on the right side. This condition is called kill screen because the game is killed here. A perfect Pacman game is when you eat all your dots, power pellets, fruits and all ghosts when they become blue and you never lose a life even once and complete all 255 levels till there is kill screen. Then you get a grand total score of 3,333,360. Hopefully, this information has made you eager to play this amazing game. So, go ahead and start having fun with Pacman.